At the 50th Annual General Meeting of the International Chamber of Commerce Sri Lanka (ICCSL) Keerthi Gunawardane was re-elected as the Chairman. He has been a successful past president of the Sri Lanka Association of Printers; he managed to negotiate with the Government authorities to make paper duty free and made many changes in the printing industry. This created many opportunity for local printing companies to improve their quality and export their products to the global market. He said that implementation of the TFA will serve to support and strengthen Sri Lanka’s current trade facilitation efforts, further promoting trade-led growth and job creation and by making it easier, quicker and less costly to import and export, the Sri Lankan business community will also be better able to tap into global supply and value chains. “TFA would have a bigger impact on international trade than the elimination of all the world’s remaining tariffs. Recent WTO studies suggest that improvements in border administration throughout the world could boost global GDP by $1 trillion per year. The biggest benefits of the TFA would be for SMEs and developing and emerging economies, where businesses and consumers would reap the benefits of greater integration into global markets,” he added. 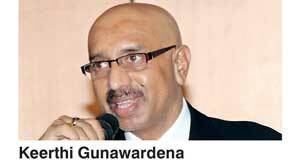 Gunawardane noted that Asia has become the largest investment zone in the world but Sri Lanka has not attracted enough Foreign Direct Investment (FDI) compared to other Asian countries. During the year 2016, ICC launched a Foundation Certificate in International Business (FCIB) which was launched to target young professionals, conducted a series of seminars with the Department of Inland Revenue, the SAARC Arbitration Council and the Federation of Chambers of Commerce and Industry of Sri Lanka (FCCISL) to create awareness about the regional arbitration facilities for business, a session on ‘WTO Trade Facilitation Agreement and its relevance for Sri Lankan Businesses’ and also with the RAK Investment Authority of UAE about opportunities in both countries. A number of landmark agreements were also signed; ICC International to bring ICC products to Sri Lanka much faster, a Commercial Agency Contract with the ICC Academy, to pave the way for the introduction of ICC Academy programmes and services for the benefit of bankers and business professionals in Sri Lanka during 2016. He presently serves as the Chairman Advisory Committee to the Export Development Board on Printing and Packaging and as Vice President of Sri Lanka Printers Co-operative Society. He is an Executive Council Member of Federation of Chambers of Commerce and Industry Sri Lanka (FCCISL) and South Asian Association for Regional Cooperation (SAARC).